I felt pretty satisfied looking down at my kitchen bench. Sure it looked ridiculously crowded, and if someone had asked for a sandwich at that particular moment, I would have had to point them in the opposite direction…but. There was still that sense of satisfaction. Satisfaction in the form of my bench tops being full of bacteria, and lots of it. There was the ever-present sourdough starter bulking up and bubbling away, there was the slowly sprouting buckwheat, gaining little green tails. 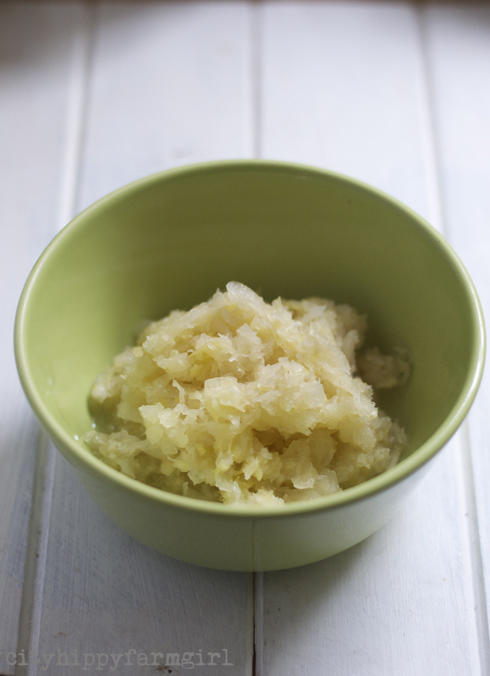 There were kefir grains in the wings waiting, and the new guy who only speaks a little English… Herr Sauerkraut. I’d finally taken the plunge, and had jumped in. I had been put off by pictures, wafty smells and stories of mouldy cabbages. Also the length of time to do it and having no bench space or proper pot to make it in. Saskia and I had talked of it awhile ago and then there it sat. A suggestion, a hint, sauerkraut were you going to happen? I looked up lots of recipes and decided that a quick and easy version using sugar, and vinegar seemed like a good option. Twenty minutes cooking no problem! But I held back. I make sourdough, I make yogurt, I sprout things, I wanted to try kefir, was I really going to be content with a twenty minute version or should I try and do it properly? Well, put it like that and there sat my answer…get going girl. Half a cabbage cut as finely as possible. In a bowl with two teaspoons of salt and crunch it all up in your hands. Breaking it down, releasing the juices. (Unless you have arms of steel, I crunched it a bit and then left it, going back and forth over the next half an hour or so.) Then in a clean glass jar, squash it all in with the juices sitting at the top, (it breaks down a lot.) My half cabbage was quickly nothing in size and I wished I had more to put in there. Lesson learnt for next time. 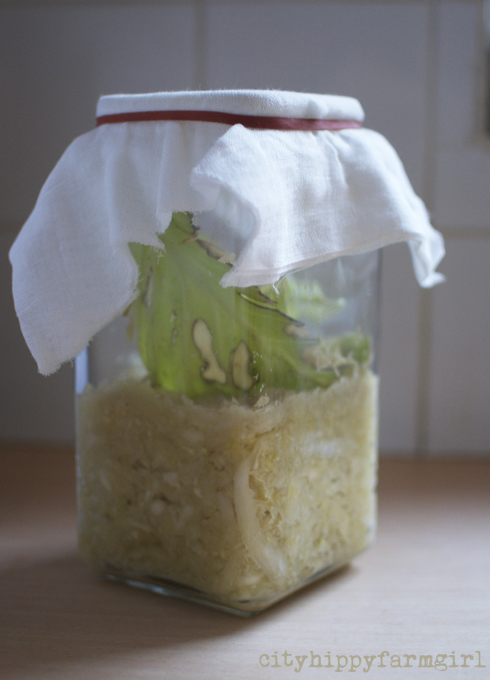 I’d kept one outer leaf to put over the top of the cabbage mixture and then some muslin and a rubber band over top. Now the waiting. One week to 6 months is how long you can leave it. Due to teeny tiny kitchen bench spaces, I was not going to be waiting 6 months. Projects were lining up on the bench tops and a week was all I was giving it. Taking the muslin off, the outer cabbage leaf out and sticking my nose in, what do we have? Bless my birkinstocks if we don’t have sauerkraut. How about you, have you made sauerkraut? 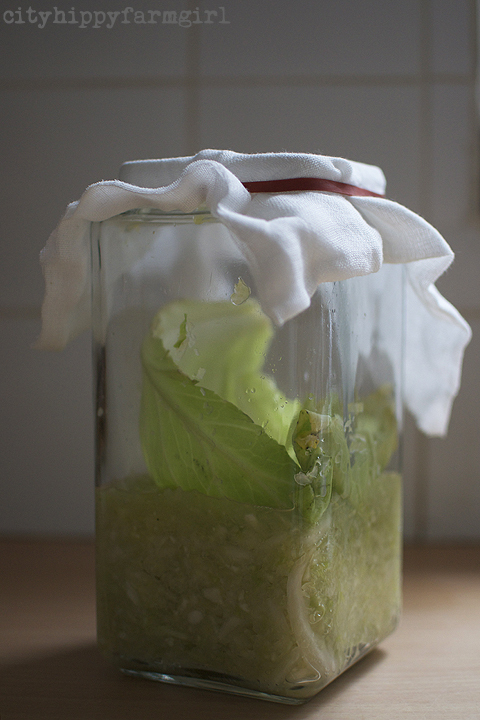 Does the fermenting world entice you or scare the pants off you? 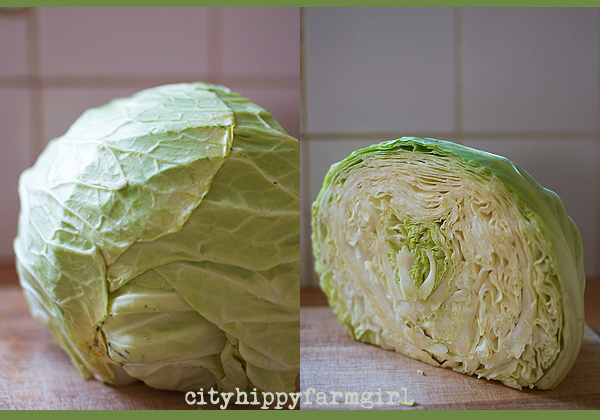 This entry was posted in Food Glorious Food, Making, Creating + Frugal Living and tagged cabbage, Eating Locally, fermenting, how to make, natural fermentation, sauerkraut, slowfood, sydney by cityhippyfarmgirl. Bookmark the permalink. The cost would be a sneeze…although not on your sauerkraut! The quick version looks really neat. Definitely worth a try.Did you do a taste comparison with storebought? Usually homemade tastes so much better. Pretty darn similar Jovina, which I was thrilled about. Jane, please do it 🙂 Fermentation is my favourite word at the moment, so there is a whole lot of bubbling bacteria on my benches at the moment. The more fermenting friends the better. As for the sourdough roll, snag, mustard and sauerkraut? Did that, and the verdict was a happy one. Yay Brydie! You made it! I can’t wait to try it myself, especially now I know it’s so easy. Your first photo is just perfection. Can you send some over please? My pastrami sanga is crying out for some. Soooo easy Saskia, and a big thank you to you for the sauerkraut push. I’ve done a second batch, and I think it will easily be something that is just regularly in my fridge now. You clever girl. Sauerkraut I have never made. but i do make a good chocolate and sauerkraut cake. Get out of town Tania! How does that work?? Oh easy I should post ….do you think? Oh yes indeed…I’m so intrigued. Yum, that sounds great! sounds like a nice easy place to start with fermenting too. Im a little confused, did i read it wrong but you mention using sugar and vinegar but i can’t see where and how much you added? Sorry if that was confusing Racheal. No sugar or vinegar in this at all, (that would have been if I had gone with the twenty minute version.) The week long one is purely cabbage and a little salt. 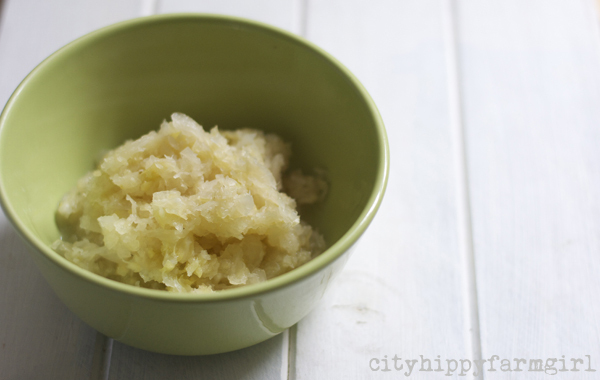 Wow, I can’t believe that I have never thought to make sauerkraut before. I used to just buy it. This is a great idea! oh this is almost TOO easy! I do love a good sauerkraut, teemed with some German sausages, yum yum! Those two are good combinations are’t they Lisa. Indeed I have made it. Only I made it in a grand, large, pickle jar made of stone. It stayed fermenting in my pantry cupboard. Perhaps I made too much (there were a dozen cabbages involved) but for the work involved in hauling that stone jar out and back in and the HUGE amount it made, I started searching for stor- bought again (in the little glass jars). Too much work! It looks great Brydie! I love sauerkraut with roast pork-yummo! Yum! You’ve got to try using a purple cabbage next time. So pretty! I just rinsed my hands so I could type. I’m making this right now. Decided on a whole head of cabbage based on your comment, as we really love to eat this stuff. In a week or so I’ll report on how my attempt turned out. I just had some more of my batch for lunch Misky and it was very satisfying! Fingers crossed yours works out just as well. Did you let it sit, or did you stir it daily? Mine is bubbling! What day are you up to Misky? Have the bubbles stopped? Bubbles are fine, and the sauerkraut is just doing it’s thing. How is the smell- a strong cabbage smell? Day 5, and yes, the bubbles stopped. Just tasted it, and it’s quite sour. A sour cabbage scent, I quess is how I’d describe it. The large leaf of cabbage on top has some black spots, but I don’t think it’s mould – just discolouration. I hope. It’s not fuzzy like mould. Did you rinse the brine off before eating it? Yes, the cabbage leaf changed colour for me but didn’t have any mould on it and it didn’t effect the sauerkraut that it might have been touching underneath. The brine I just kept in there and drained off before it was eaten, so not too soggy. Drained, not rinsed though. Out of curiosity, what’s the weather like, how warm is it in your kitchen at the moment? I have it on a shelf in my pantry, door closed, where it’s a constant 24c during the day and only a smidge lower at night.I think I’ll give it a few more days, just to see if the flavour sours more. What’s the temp where you stored yours? I’d used a bigger rock salt as well…the taste test will be the clincher Misky! I’m drooling thinking of the sauerkraut I made a couple of times. So much better than the bought stuff but not sure if I’d make it here in the tropics in summer. Winter here now so I should get to it!